There’s a mystery engine on the Island of Sodor! Travel on an exciting journey with Thomas and his engine friends in this all-new movie adventure, tracking down clues, discovering a lost engine and revealing the power of friendship in the CG animated Thomas & Friends®: Blue Mountain Mystery – The Movie arrived on Blu-Ray/DVD Combo Pack, DVD, Digital Download and On Demand, September 18, 2012 from Lionsgate Home Entertainment and HIT Entertainment. When trouble strikes at the Blue Mountain Quarry, Thomas is sent to help his Narrow Gauge engine friends. He catches a glimpse of a small engine trying to hide, yet no one will provide any clues to the engine’s identity. Thomas is determined to get to the bottom of the mystery but discovering the truth is harder than he imagined! Will Thomas be able to save his new friend? Or will the mysterious engine be sent away from Sodor forever? Join Thomas and his friends for their most mysterious adventure yet in a movie the whole family will love! We love the full length Thomas & Friends movies and I personally think that this one is the best of them so far! With new characters to cheer (and boo) and a chance to learn more about narrow gauge engines - something we don't see on the regular series, this story gives kids the opportunity to experience age appropriate suspense over wrong turns and the joys of watching their favorite little blue engine succeed in the end! This DVD kept my kids riveted in their seats through multiple screenings and has kept them asking for it to be played regularly at our house! 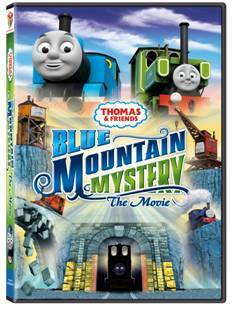 Win your own DVD copy of Thomas & Friends®: Blue Mountain Mystery – The Movie - Just fill out the rafflecopter form below! Disclaimer: I received this DVD at no cost for the purpose of my review. All opinions are my own.